After an outpouring of support and a modicum of controversy, Bartertown Diner and Roc’s Cakes will open at long last. The eatery, located in the former Discussions Coffeehouse (6 Jefferson SE), has been in development since late 2010 and will officially open at 11 a.m. tomorrow, June 23rd. The vegetarian eatery is worker-owned and opened as a collective where each of the employees have an equal stake in the success of the restaurant. 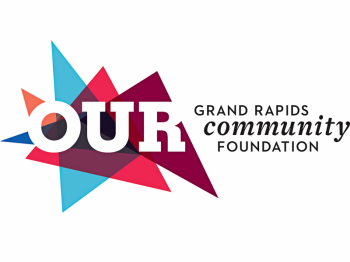 The core Bartertown collective comprises Ryan Cappelletti, Roxanne "Roc" Moreno, Matthew Russell, Onya Jackson, Mike Bussler and Dylan Putnam-Smith, all of whom have recently sworn in as members of the Grand Rapids branch of the Industrial Workers of the World (IWW) Union. Each of the members bring their own expertise to collective. Between building woes, lack of finances and a slow response from the city, the restaurant experienced its fair share of delays. It was originally slated to open on March 13. The collective did everything from scratch with as little money as they could. The cost to open the restaurant has been around $34,000 to date, cobbled together primarily from a micro-loan from a private investor and a successful campaign using the community fundraising website Kickstarter. Cappelletti estimates that he has sunk $3,000-4,000 of his own funds into the business. Kickstarter, which provides a platform for crowd-funding creative projects, helped the collective illustrate the community buy-in their project had. They raised $11,040 from 176 unique backers. Kickstarter backers were also eligible to receive rewards for their donations, ranging from a hand-decorated postcard from the staff to having the donor’s face added to the eatery’s controversial mural. Suddenly, the restaurant had a lot of stakeholders that the collective could leverage when talking to other potential backers. “It’s been just as much advertising for Bartertown as it has been fundraising” added Matt Russell, another collective member and proprieter of the vegan cookie delivery service Wednesday Evening Cookies. 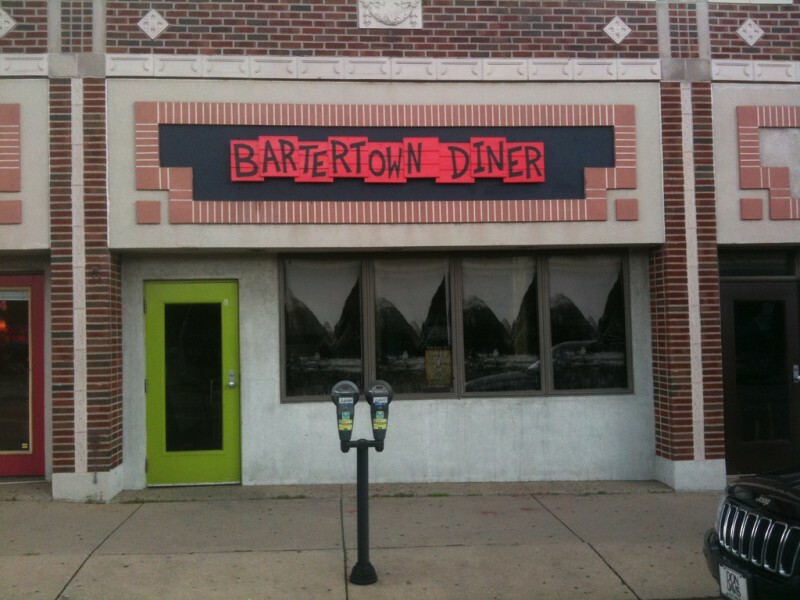 Leading up to the big day, Bartertown had a few test runs, inviting diners to three soft openings. Food for each of those soft openings were purchased and prepared on the day and ranged from imaginative offerings such as the chickpea melt sandwich to a coconut curry slaw to a three-cheese pesto melt called “The Michigander.” The soft opening selections accommodated raw food, vegan and vegetarian diets, complete with appetizer and dessert offerings. With a 100% clean bill from a city health inspector this afternoon, the collective is busy planning their opening menu (see the full menu to the right). 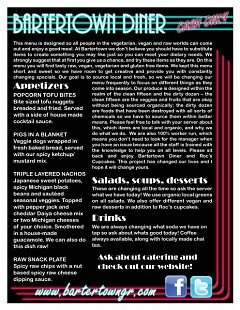 Already in the works are raw layered nachos and pigs in blankets—familiar dishes to satisfy the adventurous and entice the curious to sample vegetarian cuisine. Russell and Cappelletti estimate the average price of meals at the diner will range between $8-12. "As far as our prices go," Cappelletti said, "If you think something is too high, talk to us about it. I guarantee we'll have a reason why." 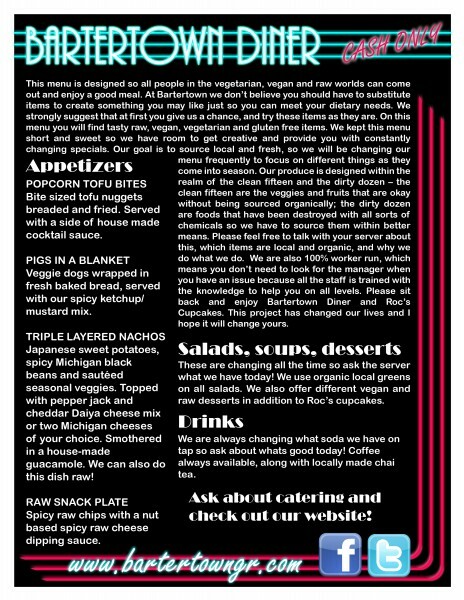 The eatery will also have a system where every day up to two interested parties can get a free meal in exchange for labor. To find more information about Barterdown Diner and Roc's Cakes visit the collective's website, Facebook page or Twitter account.